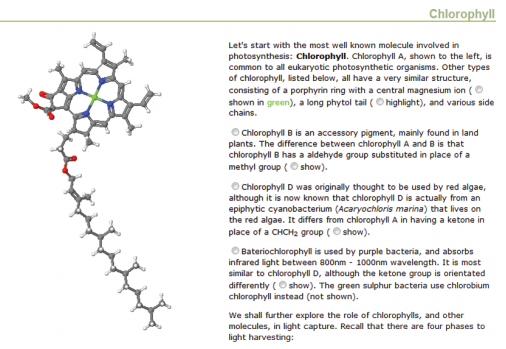 'The molecular basis of photosynthesis' is an online tutorial originally developed at the University of Cambridge and published online as an OER. The tool was designed to demonstrate the key molecules involved in the process of photosynthesis, to help students to understand the key events in photosynthesis at the molecular level. It was created using Open-source software tools including Jmol (a 3D molecular viewer), PDB files from the Protein Data Bank, and an eLearning authoring tool called eXe. The Plant Sciences Pedagogy Project sought to conduct research into teaching and learning within the department of Plant Sciences at the University of Cambridge, and to develop new e-learning materials in light of the research findings. Here I will describe one such e-learning tool that was developed through this process, to help students understand photosynthesis on the molecular level. One of the findings from the pedagogy projects was that some students have difficulty understanding events in photosynthesis at the molecular level, in part because the relationship between structure and function is difficult to visualise. Our solution to this problem was to create an online tutorial using Jmol, which is open-source software for embedding 3D molecular structures into web pages (http://jmol.sourceforge.net/). This allows students to see what is happening on the molecular level alongside a narrative of the process of photosynthesis. An online tutorial allows students who feel they need extra support to access the resource at times which are convenient to them. Teaching at Cambridge is primarily through lectures; the online tool didn’t seek to replace lectures, but rather to augment them. The course notes formed the starting point for the tool, as a backbone to weave the visualisations into. The next step involved identifying theappropriate points within the process where extra insight would be gained by using 3D molecular structures, and then sourcing appropriate molecular structure files (formats including .pdb or .mol files). The protein databank (PDB) is an excellent resource for this (www.pdb.org). In a sense, the choice of topic was fortunate here as photosynthesis is very well studied, so consequently all of the necessary 3D structures have been published. Bringing the 3D structures and narrative together involved downloading a local copy of Jmol, and writing a html page with frames to display the selected molecule in one panel, and the text (with embedded radio buttons for molecule selection) in the other. Jmol is compatible with any Java-enabled web browser, and by downloading a local copy can also be used when ‘offline’. To make the tutorial easier to navigate, a second version was created using eXe to construct a menu structure and navigation through the different sub-topics (http://exelearning.org). A screen capture from the tool is shown below. Combining the 3D visualisations with a narrative is a powerful format. This was important because (a) the tool needed to be tailored to the lecture material in order to be seen as relevant and trusted by the students, (b) it is all but impossible to relate the structure and function of complex macromolecules through 2D representations and (c) students ‘don’t know what they don’t know’ before starting a topic; the course materials provided a narrative to the tool to guide learners through the process, which is much better than providing the relevant 3D structures alone. It is worthwhile to note that I also constructed a ‘library’ of 3D molecules using Jmol, which sought to include structures of as many of the key molecules covered in the 2nd year Plant Sciences course as possible. However, when evaluating the new tools, it was evident that students preferred the combination of 3D molecules with a narrative rather than one in isolation. The tutorial seemed like an excellentcandidate for adding to the Jorum repository for Open Educational Resources (OER), as photosynthesis is such a ubiquitous topic (www.jorum.ac.uk). As a result of submitting the tool to Jorum, it won first prize in the 2010 Jorum Learning and Teaching awards. The judges praised its structure, combining visualisation with narrative to bring the text to life, and its potential for reuse; this format has the potential to be applied to a plethora of topics within the Natural Sciences, as the PDB contains over 70 thousand crystallographic records and is constantly growing. It has been very rewarding to see the tools popularity with learners across the globe through publishing online such as OER. Jorum has a large collection of OER for the Biosciences (868 records tagged with ‘bioscience’ as of 27/01/2011), and is definitely worth checking out if you are looking to enhance a course with online learning resources. This case study originally appeared in the Spring 2011 edition of the Higher Education Academy Biosciences Bulletin.